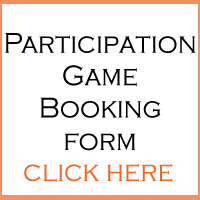 We are now open for applications to present participation games at Hammerhead 2019. This year we are trialing online bookings, all game applications via the link below please. Please complete your applications by 30th November 2018 to allow plenty of time for planning and promotion. After completing and submitting your booking form, you should receive an acknowledgement email confirming receipt. If after 14 days you have not received an acknowledgement please contact us.